If you are considering a gold bullion investment, then you may want to look at British gold coins, and compare them with coins minted in other countries. For a long time the only gold coins that investors were interested in were gold Krugerrands, but other countries started to follow the lead of South Africa eventually and offer standard gold bullions which were very attractive to investors and quickly became popular. These coins include American Eagles, Canadian Maple Leaf, Chinese Panda, Mexican Libertads and many others. If you are going to compare British gold coins with other types of bullion, you need to make sure that the comparisons are thorough, so you can find the best coins for your investment needs. One option if you want to invest in recognized gold bullion which are popular are Australian Gold Nuggets. These options are minted by the Australian government, and they come in standardized sizes to make investing in them easy and worry free. This is also true of many British gold coins as well, because the newer issues contain a specific weight and purity of gold that is displayed on the coin. Many of the old British coins may have various amounts of gold included, but these are usually purchased for their numismatic value rather than their bullion value. 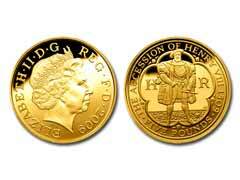 When it comes to gold value, British gold coins offer the same benefits that all gold coins do. As long as you choose British Sovereign gold coins or other solid and popular bullion coins it does not matter which country they come from for many investors. There are some tax considerations though, and you should research the tax implications on your investments before you choose the right types of coins. British gold coins may be exempt from the VAT, or value added tax, and this can help increase the returns you will see if you choose these coins instead of other types. British bullion, however, is not a highly popular choice among investors because it carries higher than average dealer mark ups and may be harder to sell compared to its American, Canadian and South African counterparts. British coins of older mintages similar to Russian gold coins are considered more collectibles rather than an investment mechanism and are purchased for their rarity factors dictating significantly higher price than their actual metal value.